the house. This is a low-priority project. I work on it when more urgent projects are waiting on the bench for something to set up or for something I ordered to arrive. 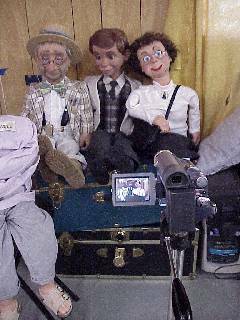 The introduction to the video will pan around my studio showing various completed dummies that happen to be here. Panning isn't that easy. I tried hand-holding the camera and walking around, but the result was jerky with a noticeable bump with each step I took. I do not glide gracefully when I walk. And so I built a camera dolly, a device on wheels that you can pull along a track—in this case a virtual track, not a real one—along the floor while operating the camera. 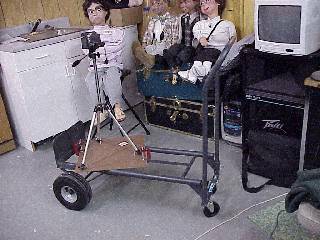 My dolly uses a hand truck that I use to schlep my sound system and electronic piano. 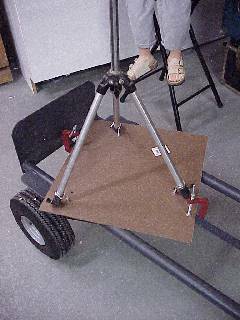 I mounted an old el cheapo camera tripod on a piece of fiberboard and clamped that platform to the dolly as shown here. The bolts are large threaded hooks. I bent them in a vise to get the proper angle for bolting the tripod legs down. Then I used C-clamps to hold the platform securely on the dolly. This is what everything looks like to the camera operator. look so cluttered and get the kitchen sink out of the movie.